We are VERY pleased to welcome you to A Very Chic and Totally Odd Hop! Chic Tags and Some Odd Girl have partnered up to show you some magic that combines our products into BEAUTIFUL paper crafting projects! We're so glad you're here! Now through Sunday at midnight EDT, you can enjoy some gorgeous inspiration from the Chic Tags Creative Team and the Odd Girls, leaving your comments at each stop along the way, and on Tuesday, July 1st, a winner will be announced at each blog... Both winners will get $15 to spend at EACH of the Chic Tags and Some Odd Girl shops! You should have arrived from the Some Odd Girl blog; there are 11 stops in total. As you make your way around to each of the blogs, we are QUITE sure your head will be spinning with ideas! The Chic Tags Creative Team was certainly inspired by the fun Some Odd Girl stamps they received, and we think you're going to like what's in store. I made my layout using the darling "Happy Day" stamp set, and the pretty Cloud 9 collection. I just love that sweet little cloud stamp! 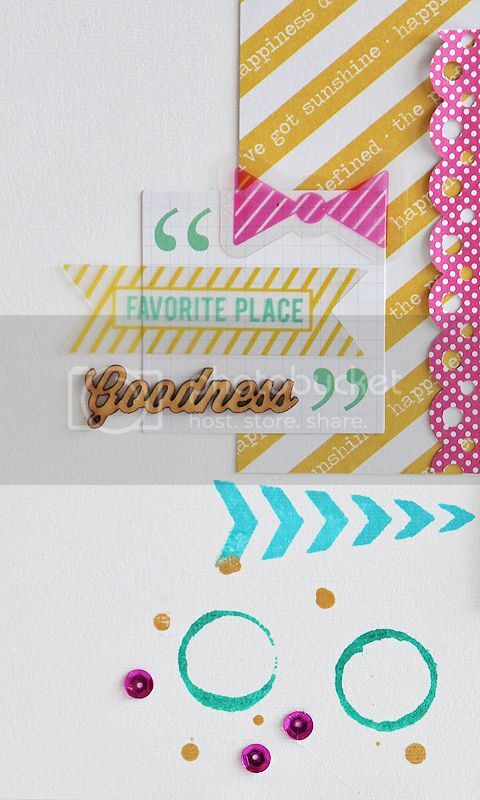 It looks so cute on any type of layout, and is perfect to mix with the wood veneer clouds! From here, you're heading over to visit Mary Pat Siehl's blog. Be sure to comment on ALL posts, and you'll be eligible to win! Wow!! Fab layout!! Love the mix of colors!! You totally rocked the stamps with your LO and you're right, the veneers and stamps go great! Super cute! Love the bright colors! Very nice LO! I love the way you incorporated the stamps! Love how fresh your layout looks!! Lover you layout!! Awesome colors! Beautiful layout! the clouds both wood & stamp are a great touch! Wow! This is just awesome! In so many ways! Brilliantly done! Fabulous layout! Thanks for the inspiration. love the wooden clouds with the hearts! How cute! I love the little wood clouds! This is so much fun! I love the colors and stamping on here! Very beautiful layout and I LOVE the arrow stamp too! What a fun layout! I love the blue of the clouds and the acetate pieces. Great photo too! Lovely layout! I'm lovin clouds right now and your combo of stamps and wood veneer is just perfect! Such a cute layout - love the cloud stamps ! Love all the cute embellies you used on here, such a cute layout! Love the bright pops of color against the white. The cloud stamps are adorable! Love the little girl behind the "real" little girl. Darling layout. So, so cute! The colors zing and the stamp set I love too! Adorable pic. Card and LO very cleverly put together! totally adorable layout! Love the veneer and stamp combo! Very cute! I love the cleanness of the layout! Loving this layout <3 all the elements go so perfectly together! !